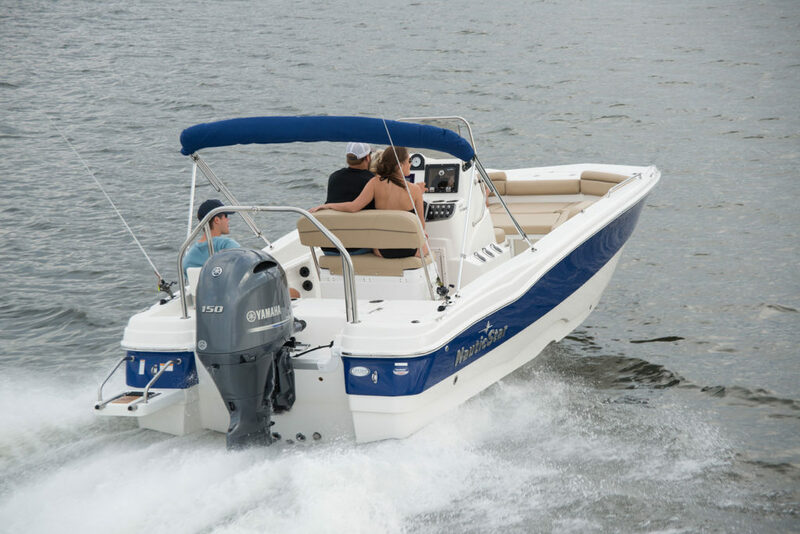 Sure to be the crowd pleaser, the 211 Hybrid does it all featuring the STAR Performance System. 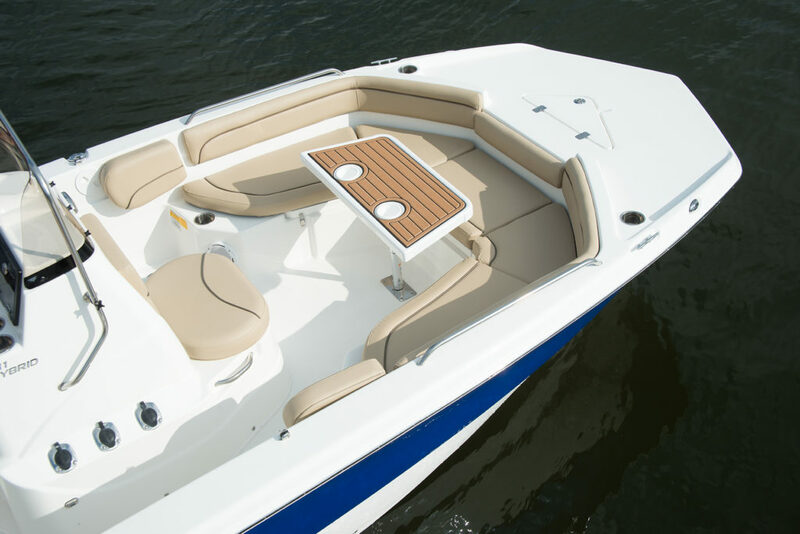 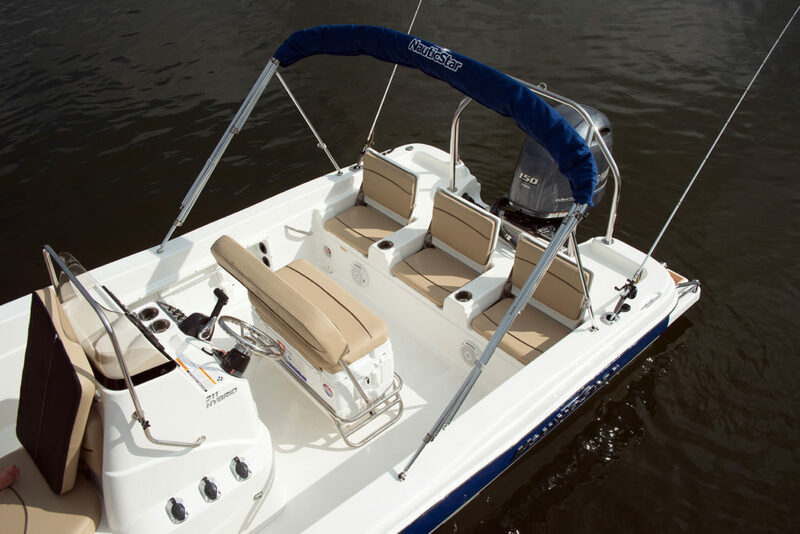 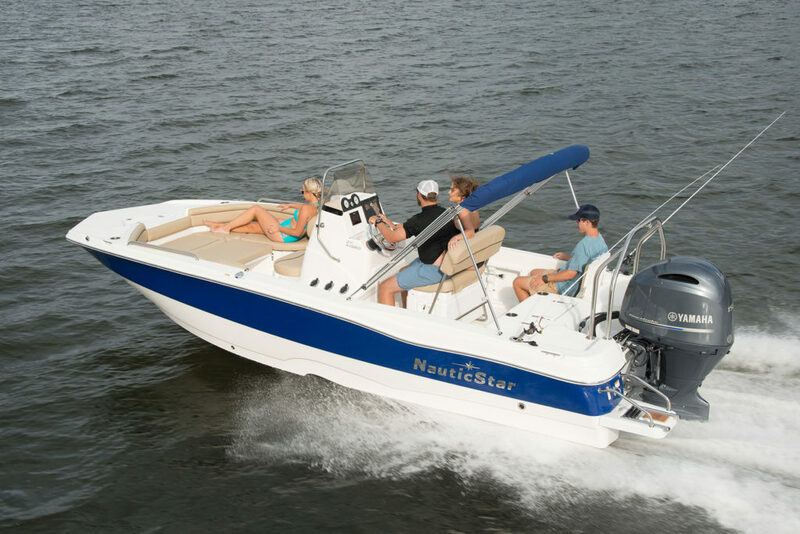 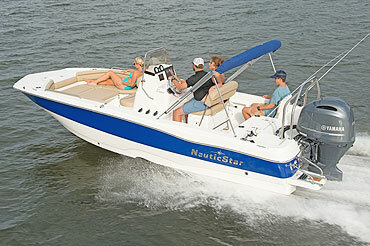 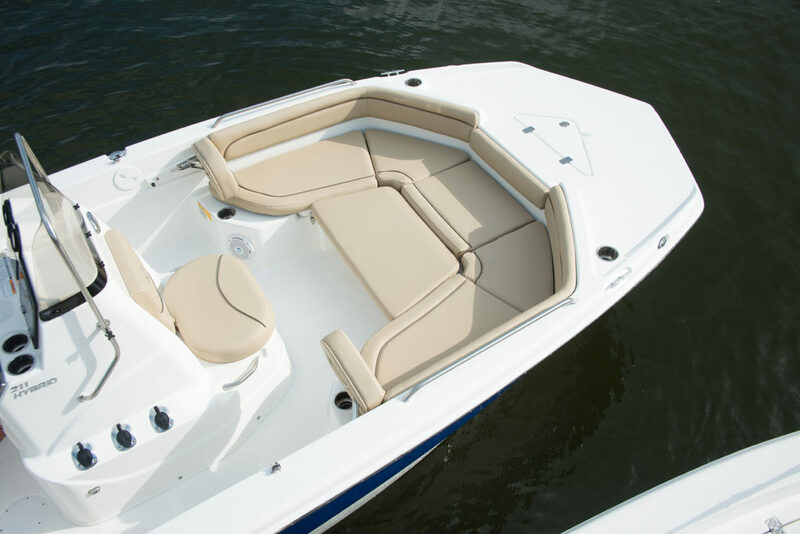 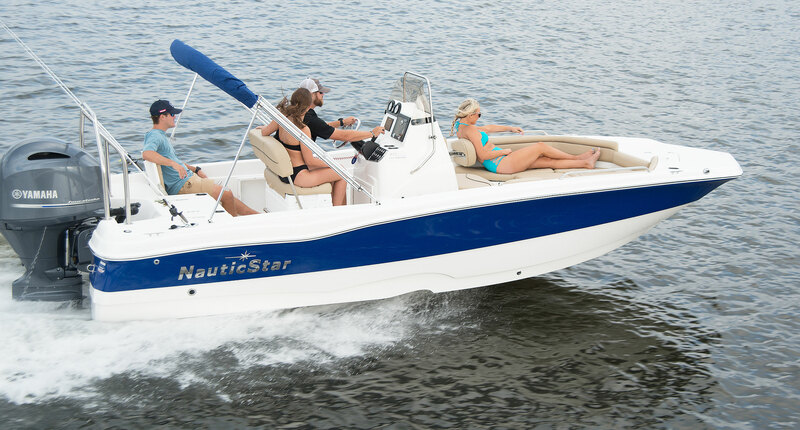 3-across rear seating and bow seats for 5 make the 211 a relaxing pleasure boat. 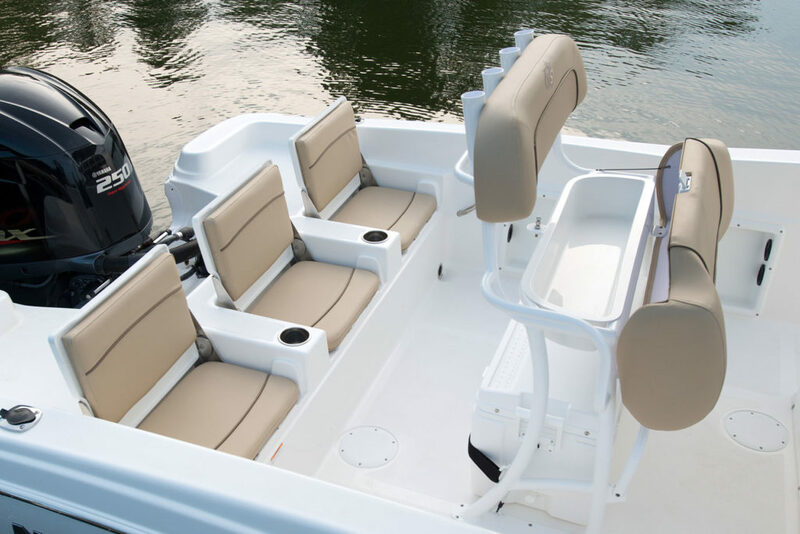 Then you can get serious about fishing with standard features like a center console with rod holders and 13 gallon livewell/baitwell. The aft and bow seats even convert into casting platforms and is utilized for cast net storage, battery storage and 27-gallon aerated release well. 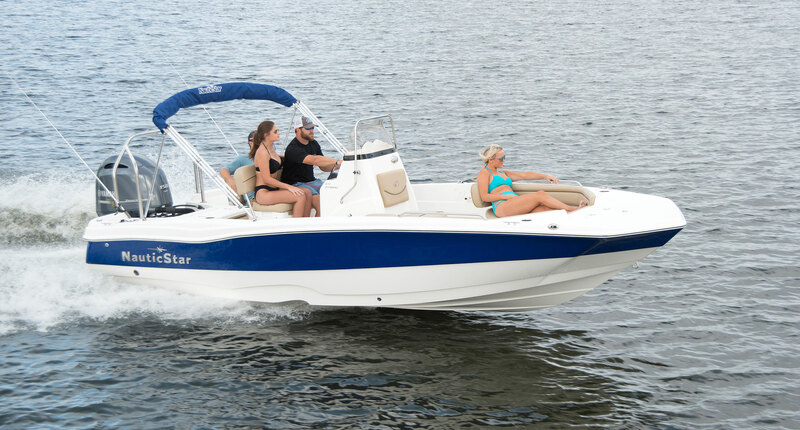 Not just a crowd pleaser, the 211 Hybrid loves a crowd. 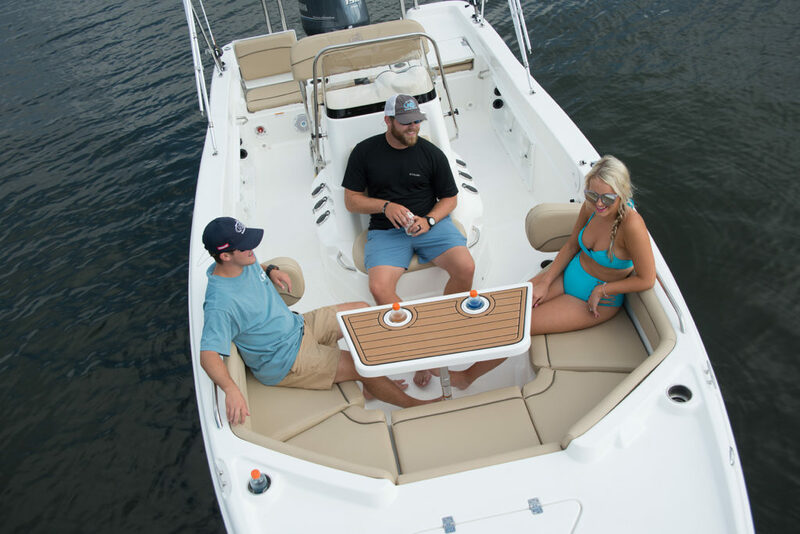 Turn your 211 into a Sport Deck by adding the sport package that includes a swim platform, Bimini top, and Infinity stereo system. 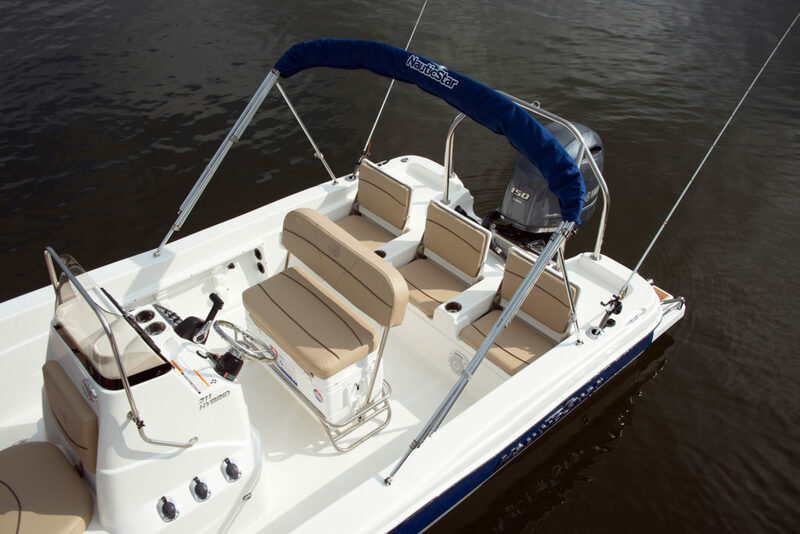 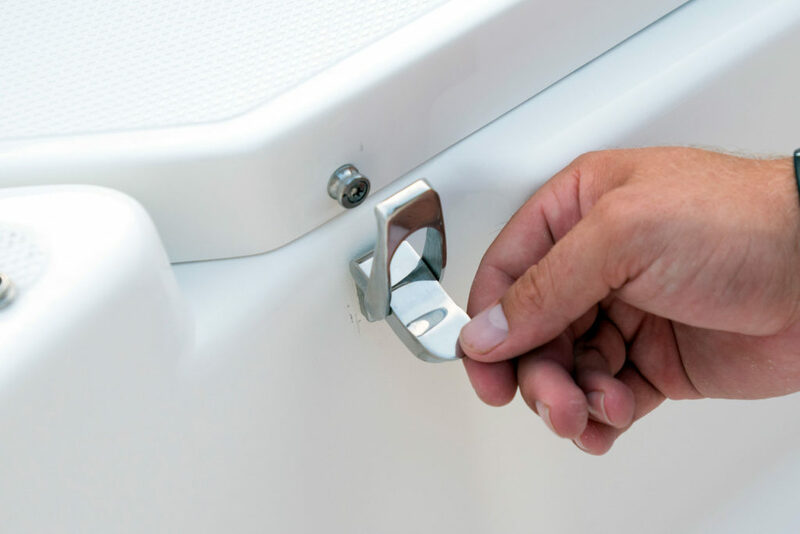 The bow is very versatile for fishing or pleasure boating needs. 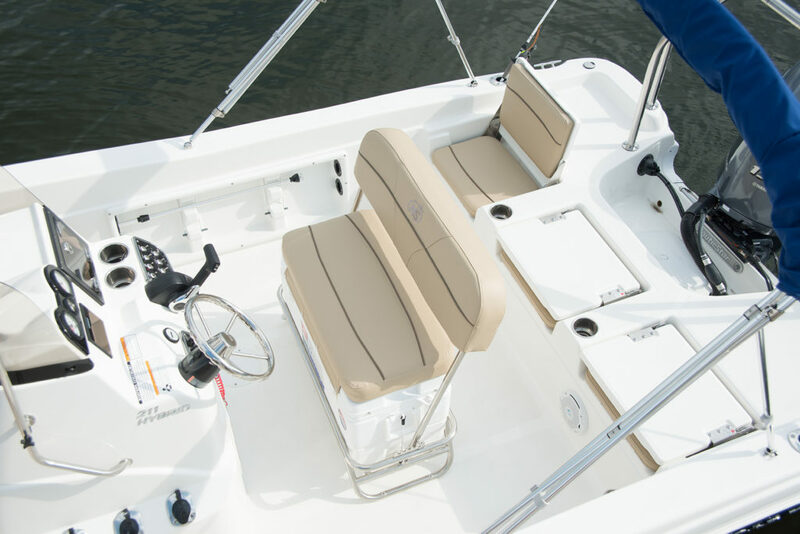 Port and starboard compartments are insulated for use as fish boxes or storage. The center compartment is a 15 gallon cooler. The console has a forward facing seat with a 13 gallon livewell/baitwell (shown with the head console option). 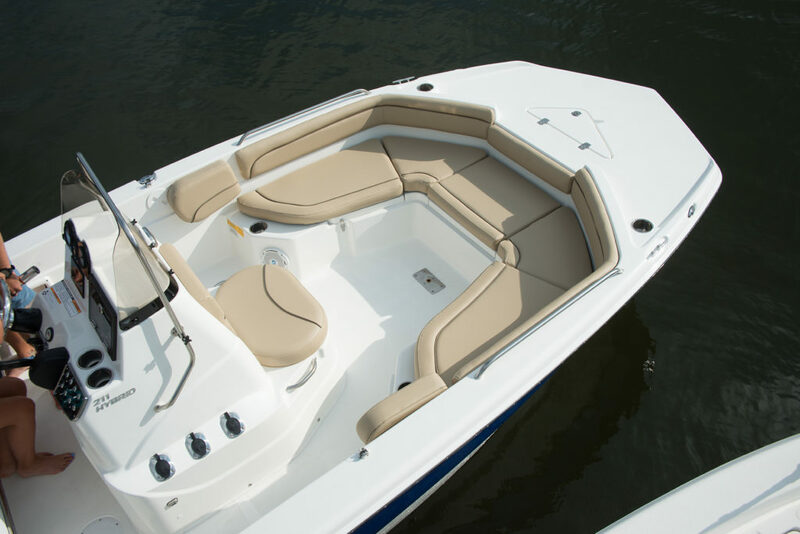 The 3-across jump seats complete the aft fishing deck when in the closed position. 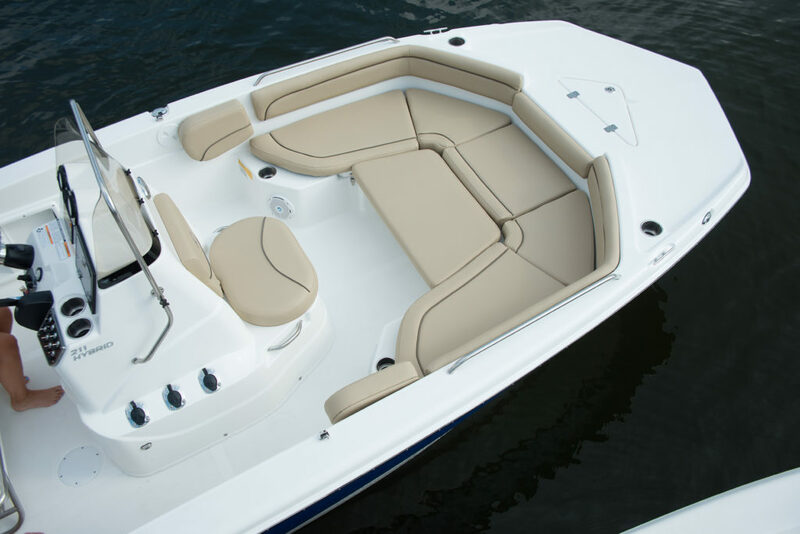 The easily convert to passenger seating when the backrest is flipped-up. 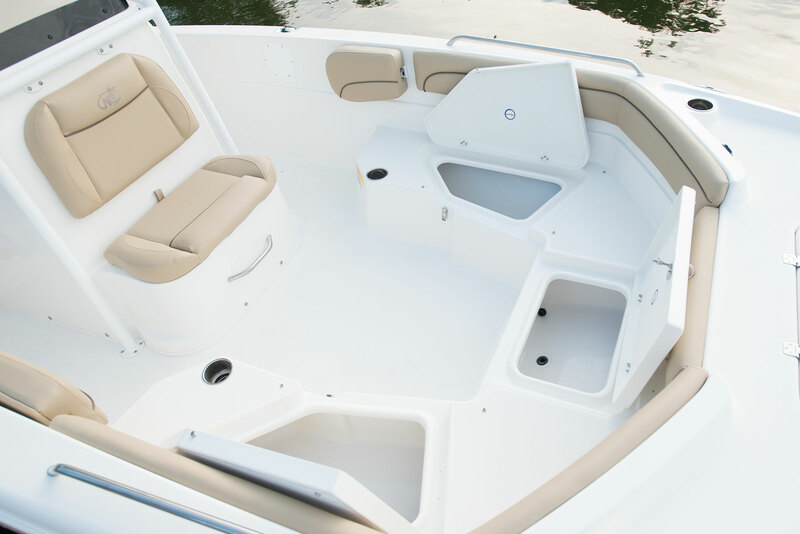 A cast net/bucket storage compartment is under the port seat and battery storage in the starboard seat. 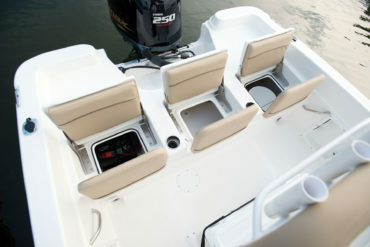 The center seat has a 27-gallon livewell. 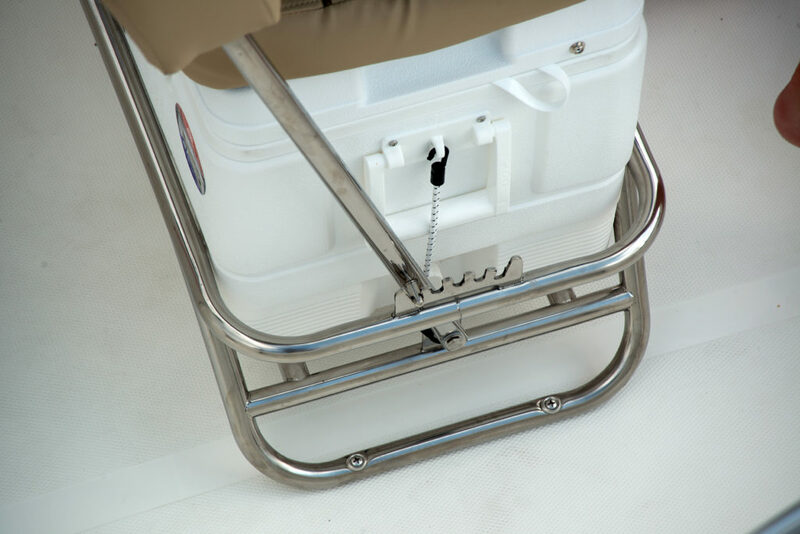 Also shown are the stainless steel drink holders and optional fishing seat bases. 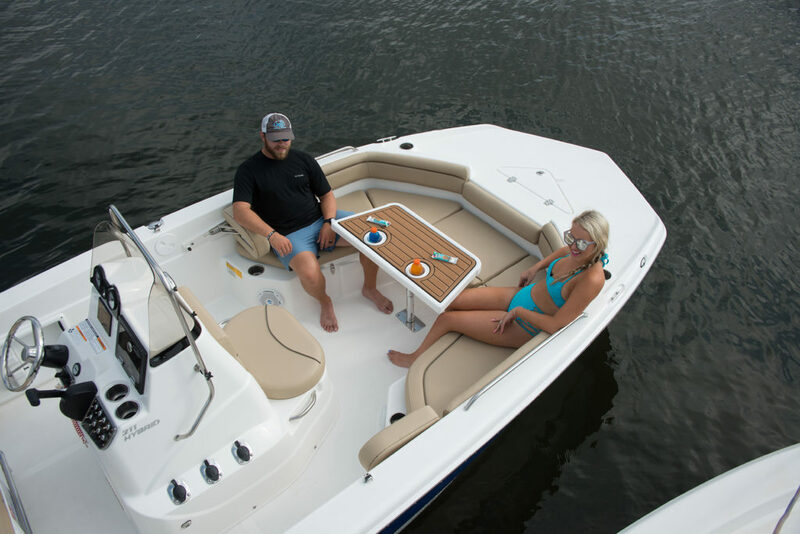 With the bow filler cushion, the forward lounge area turns into a comfortable sun deck! 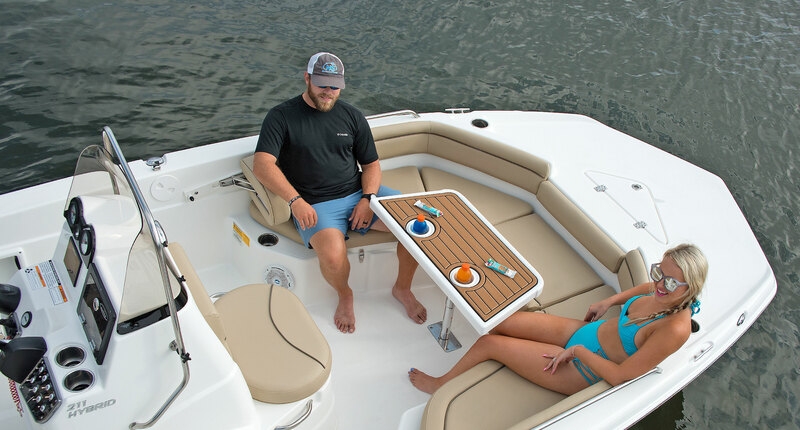 The optional removable table and flip-out backrest add a great family friendly feature for a picnic out on the water. The table also serves to complete the fishing deck when in the down position. 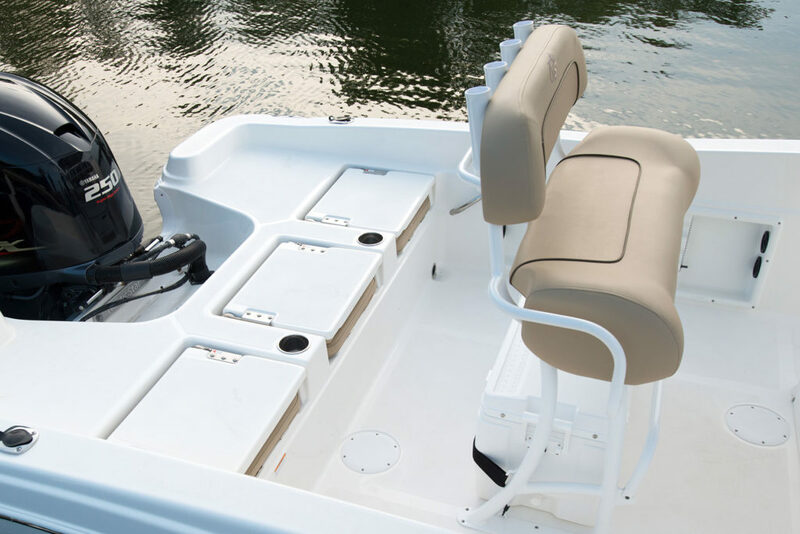 The backrest flips up to form the comfortable seating and flips-down to form the aft fishing platform. 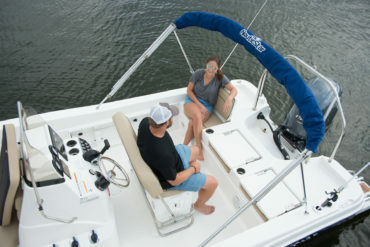 The flip-flop leaning post easily changes positions for a aft facing seat, a leaning post or forward facing helm seat. 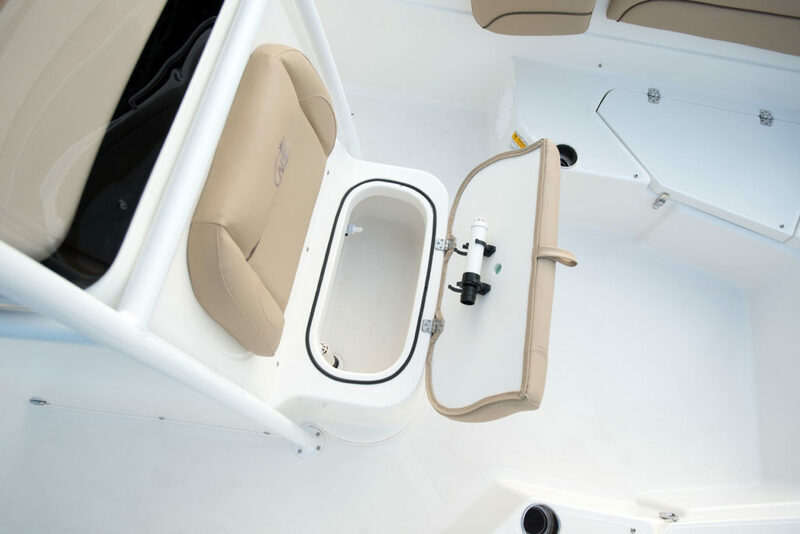 Recessed in both the port and starboard gunnel walls are horizontal rod storage racks for 2 rods each side.